Air-tite fixture sealed and gasketed to prevent airflow between attic space and living areas. Can be installed from below the ceiling. For providing accent and task lighting where insulation can be kept 3" from housing. Thermal protector deactivates fixture if overheating occurs due to improper lamping or misapplied insulation. Junction box is listed for through branch circuit wiring and has seven 1/2" knockouts and four pryouts with integral strain relief for non-metallic sheathed cable. Four remodel clips secure housing and accommodate ceiling thickness of 1/2" and 5/8". 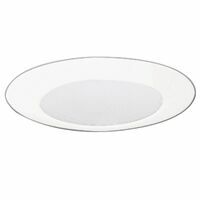 UL/cUL Listed 1598 Luminaire. UL/cUL Damp Location Listed. UL/cUL Listed for Wet Location, covered ceiling - with select trims. Certified Under ASTM-E283 for air tight construction.